Your job is tough: working with tools, machinery, harsh chemicals. You need AMMEX® Gloveworks® HD Nitrile Powder Free Industrial Gloves. The raised diamond texture provides an unbeatable grip. 8- to 9-mil thickness means excellent chemical resistance for extended-duration use. Latex-free. M-XXL, 100 gloves per box, 10 boxes per case. To ensure your gloves have the best fit and feel, we’ve created this handy sizing chart. Please keep in mind that gloves are like shoes: there are general sizes, but various styles will fit differently. Glove materials, thickness, elasticity, and texture are a few factors that can make one style of glove fit snugger or looser than another. When your job involves interacting with the public, having the best barrier protection is critical. 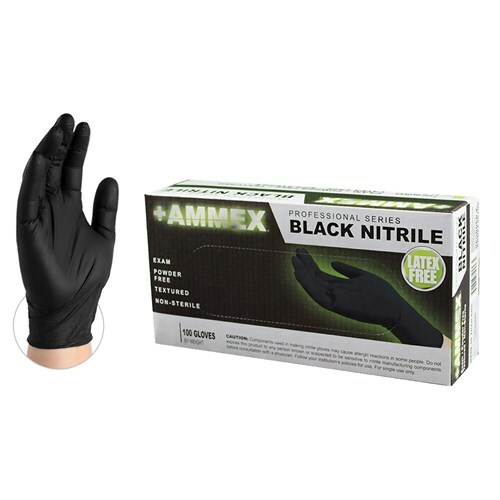 AMMEX® Black Nitrile Powder Free Exam Gloves deliver dependability, durability, and comfort. Puncture resistant and latex free. This glove says immediately that you mean business. S-XL, sold 100 per box, 10 boxes per case. 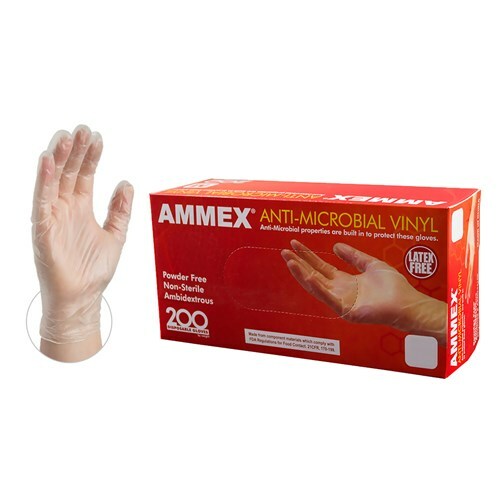 AMMEX® Clear Anti-Microbial Vinyl Powder Free Industrial Gloves take food safety seriously by providing an added layer of protection to help prevent cross-contamination. The innovative, EPA-registered anti-microbial technology is built into the gloves, so it can’t wash, rinse, or wear off. S-XL, sold 200 per box, 10 boxes per case. “Value” doesn’t have to mean “cheap.” With AMMEX® GPX3® Clear Vinyl Powder Free Industrial Gloves, value means quality and savings. 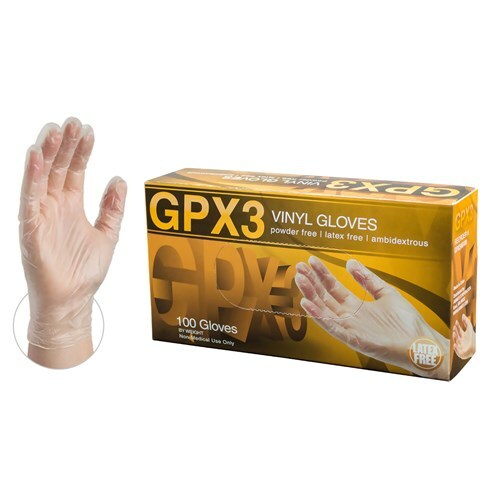 These disposable gloves provide high levels of comfort, dexterity, and tactile sensitivity for a variety of uses at a terrific price. S-XL, sold 100 per box, 10 boxes per case. 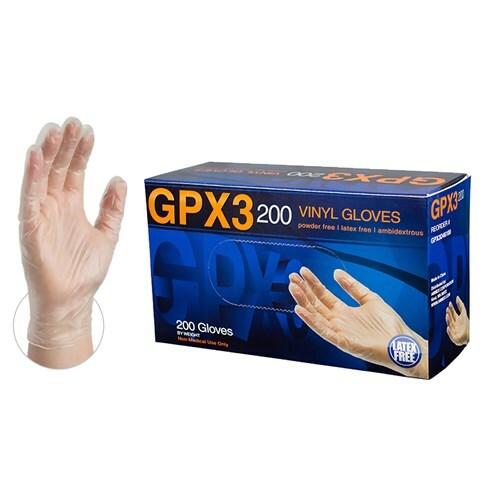 AMMEX® GPX3® Clear 200 Vinyl Powder Free Industrial Gloves are an irresistible value: good-quality disposable gloves at a great price. When you buy them in boxes of 200, 10 boxes per case, you save even more. They offer dexterity, tactile sensitivity, comfort, and barrier protection for light-duty jobs. Sizes S-XL. As a healthcare professional, you wear gloves all day. The No. 1 consideration is safety, of course, but comfort is important, too. 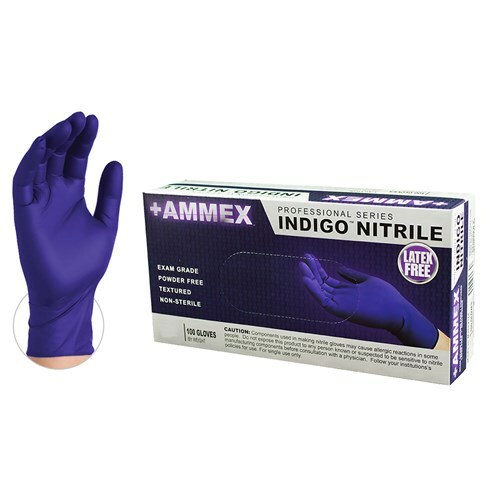 AMMEX® Indigo Nitrile Powder Free Exam Gloves meet both needs. These durable, latex-free, 4-mil gloves are popular across the healthcare spectrum. S-XL, sold 100 per box, 10 boxes per case. Not every application calls for heavy-duty hand protection. Many times, a good general-purpose disposable glove will get the job done. 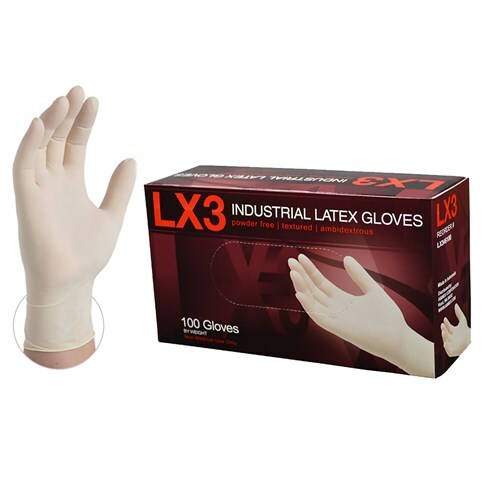 AMMEX® LX3® Ivory Latex Powder Free Industrial Gloves are loaded with features while remaining a tremendous value. Excellent tactile sensitivity in a 3-mil glove. S-XL, sold 100 per box, 10 boxes per case. 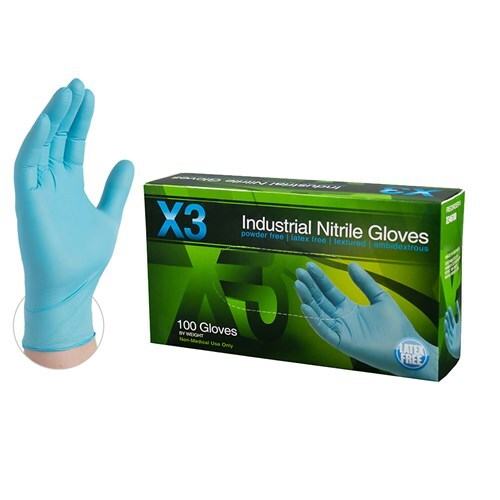 If you need a disposable glove with the strength of nitrile, balanced with excellent dexterity for lighter-duty applications, try AMMEX X3 Blue Nitrile Powder Free Industrial Gloves. Perfect for short-duration use. Our lowest-cost nitrile option. Latex free, chlorinated for easy changes. S-XXL, sold 100 per box, 10 boxes per case. AMMEX® Gloveworks® HD Black Nitrile Powder Free Industrial Gloves are the perfect blend of power and control. The raised diamond texture channels away liquid for maximum gripping power. Durable, resistant to punctures and rips. 6-mil thickness means excellent chemical resistance. Latex-free. M-XXL, 100 gloves per box, 10 boxes per case. 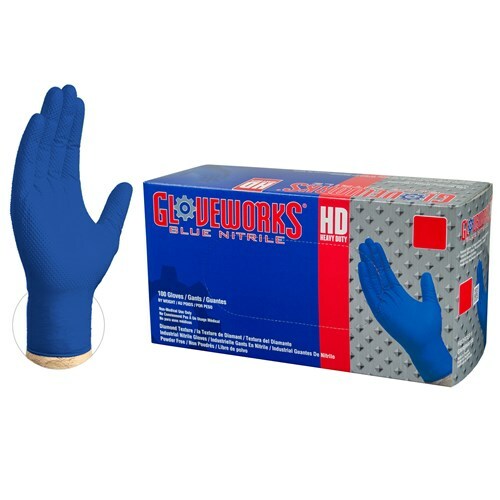 AMMEX® Gloveworks® Heavy Duty Royal Blue Nitrile gloves feature an aggressive raised diamond texture for a grip that won’t slip, wet or dry. 6-mil thickness for strong barrier protection. Resistant to rips, punctures, and abrasions. Perfect for food-processing applications. Latex-free. 100 gloves per box, 10 boxes per case, in M-XXL. Your job is tough: working with tools, machinery, harsh chemicals. 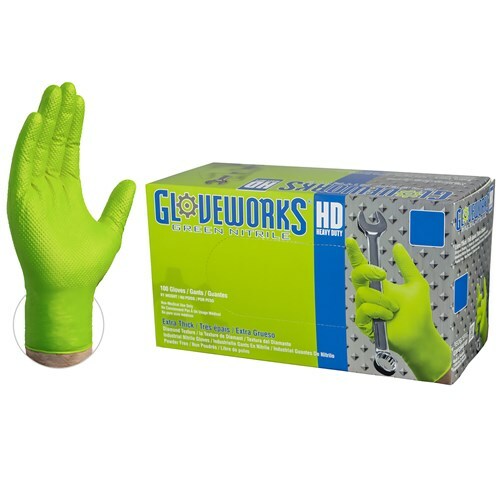 You need AMMEX® Gloveworks® HD Green Nitrile Powder Free Industrial Gloves. The raised diamond texture provides an unbeatable grip. 8- to 9-mil thickness means excellent chemical resistance for extended-duration use. Latex-free. M-XXL, 100 gloves per box, 10 boxes per case. 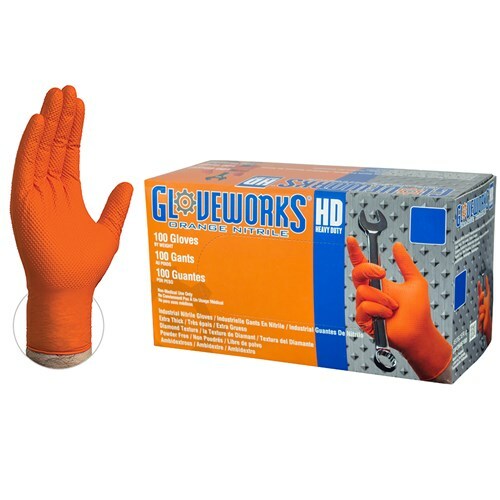 AMMEX® Gloveworks® HD Orange Nitrile Powder Free Industrial Gloves are designed and engineered to handle the toughest jobs. Their raised diamond texture provides an unbeatable grip by channeling away liquids. Excellent puncture and chemical resistance. Latex free. 8- to 9-mil thickness. S-XXL, 100 gloves per box, 10 boxes per case. The AMMEX® Gloveworks® Variety Pack has the right glove for all your home tasks: One pair Yellow Latex Flock-Lined Gloves for indoors. One pair Black Latex Flock-Lined Gloves for outdoors. One pair Nitrile-Dipped Polyester Gloves for home or garden. 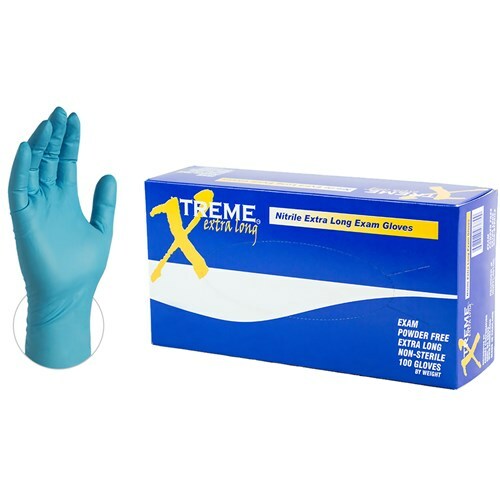 Five pairs Blue Nitrile Disposable Gloves. S/M and L/XL, 20 boxes per case. 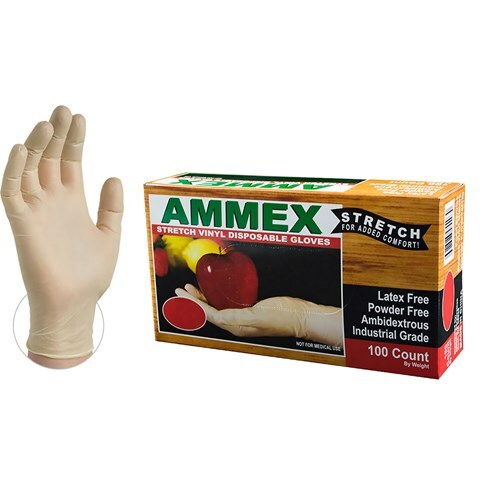 If it’s latex-like fit and comfort you want in a disposable glove, try a latex-free alternative: AMMEX® Ivory Stretch Synthetic Vinyl Powder Free Industrial Gloves. Durable and form-fitting, they reduce strain on the hand for added comfort. An excellent value. S-XL, sold 100 per box, 10 boxes per case. 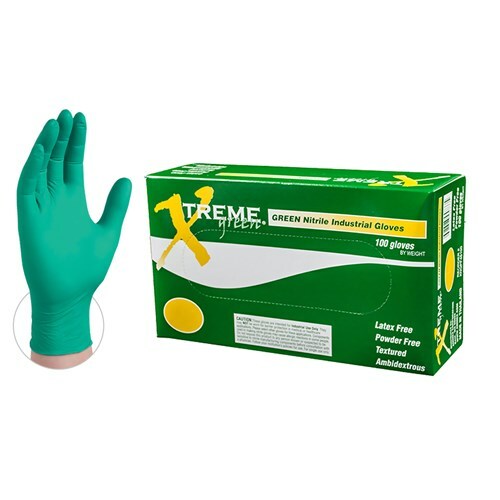 AMMEX® Xtreme® Green Nitrile Powder Free Industrial Gloves deliver, time and again, for professionals in countless applications. These gloves really stand out, and not just because of their awesome color. They combine strength, comfort, and tactile sensitivity with extended-duration use. Latex-free. S-XL, sold 100 per box, 10 boxes per case. Copyright © 2019 - Task Industrial - All Rights Reserved.